As much as some people pooh pooh the austerity of it all, there is no denying that getting back to a more simple, basic way of eating IS better than our current way of eating as a society. SUE: I’m going to burst if I don’t share this with you. I just came back from the Dr. My blood pressure was 114/68 and my diabetic level is at 6.0, the lowest on the guideline scale. My cholesterols and everything else was at or below normal. The Dr. was very impressed. He turned to me and said, “Explain to me more about this diet your on.” He wasn’t as skeptical as he was before, told me to continue with the diet. I didn’t lose any weight since last time…still at 219 lbs, but I’ll take the health benefits. Also, my BMI is at 38, it was at 42. Sue: THANK YOU for sharing this with me. I am SO HAPPY for you I really, really am! it never ceases top amaze me that our health can be turned around so quickly by taking some responsibility for the food we put in our mouths.. It’s not always easy though so kudos to you for doing this. Only lost one pound last two weeks, but in my defense, I’m dealing with a knee injury and in the middle of moving. It’s like you said in an earlier post that eating the rationing way is basically doing what the ‘experts’ have been saying all along. I truly believe that it was the elimination of processed foods that worked for me. I had tried everything else without success. My attempt at trying this diet was a last ditch effort but it paid off. It’s just the beginning though. It occurred to me that I will have to be on it for the rest of my life. I will always have a heart problem and diabetes will always be a threat, but, if I can keep at it the health issues will no longer control my life. My doctor told me I may even be able to get off of some of my meds that I have to take if my levels continue to stay as low as they are. I’ve talked to people that went through the war years and rationing. They remember going hungry and how getting something to eat was a crap-shoot at times. To the average person today they think your nuts to put yourself on such an austere diet plan. In the 1940’s they didn’t have a choice but they made it through. At the time they probably didn’t realize how healthy they were. 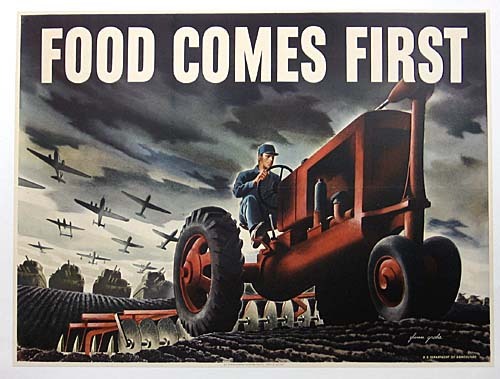 The one program that I saw about food rationing had made the claim that the incidence of heart disease and diabetes was the lowest during the war years than what they were before and after the war. Being desperate I just had to try it and I’m glad I did. Oh I agree!!! I think processed foods form such a large part of our more convenient lifestyle these days that they are bound to have a significant effect on our bodies/weight/well being etc…. coupled with our more sedentary lifestyles there has to be repercussions.